When I crested the camels hump of a hill, the suspension on the Tiger completely unloaded leaving in its wake an unnerving floating sensation. During that millisecond of weightless hang-time strangely enough there’s plenty of time to contemplate your own idiocy. Maybe I should’ve slowed down. I hope I don’t leave a crater when I come back to Earth. But, safety third! I was on a mission. A mission to see Santa. The reason that something sets up shop inside my already cluttered mind is a mystery to me. 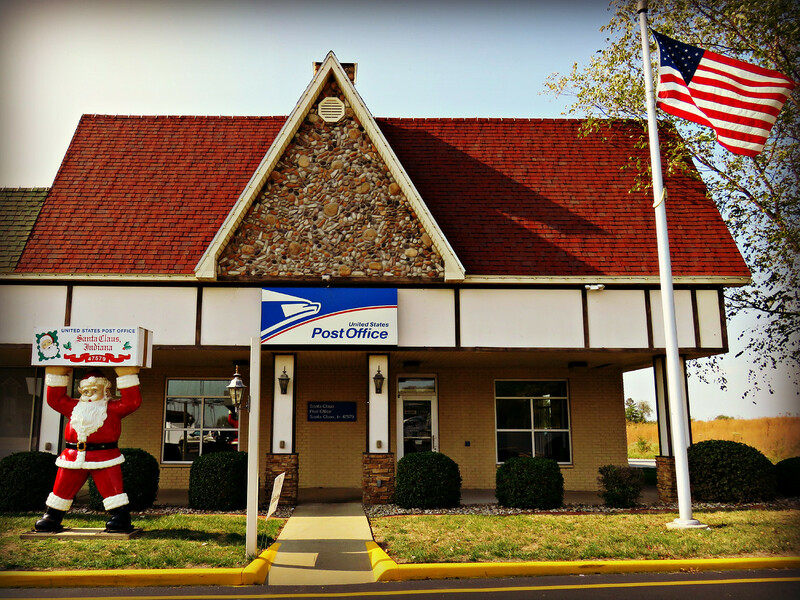 I don’t recall where, when or why I learned that there is a town in Indiana called Santa Claus. It seems like it’s been part of the landscape of my mind forever. Further testament that the internet is rotting my brain, I’m sure. Pulling in to Santa Claus (that sounds realllllly weird) on Columbus Day the town had the stink of this is a vacation town and vacation time is over on it. There was no one around. There were no cars on the road, the amusement park was closed, parking lots were barren. Griswolds at Wallyworld. Stabbing at my GPS, I found the post office and rode towards it. I wanted to send a couple of postcards. When I pulled in to the lot, I did a quick ride through to get my bearings. Though the post office closed for the holiday, I could still drop my cards in the outgoing mail since I’ve taken to keeping stamps in my wallet like an 85-year old woman. Circling through the parking lot again, I parked at the supermarket a few doors down. Front and center was a rack of postcards that I could see right through the window. It was my lucky day. Sitting out front on a wooden picnic table (why doesn’t every store do this?!) I wrote out my postcards and basked in feeling deliriously pleased with myself that my daughter Chloe would be getting a card postmarked from Santa Claus. Someday I hope these dumb things give her a chuckle. In the meantime, I’ll just make do with her breezy “cool, mom” affirmations. I’m sure it’s hard to know what to say when your mom is a fruitcake. 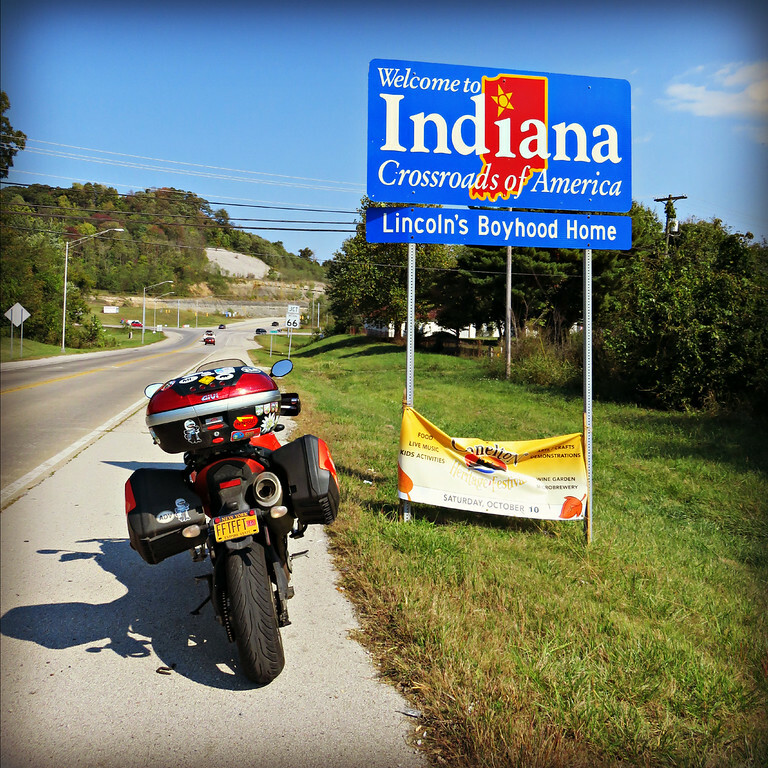 When I finished up my scribbles, I walked back to my bike and readied to shove off towards Kentucky. Standing there, rolling my squishy earplugs a pickup truck pulled up next to me with a smiling man filling the driver’s side window. A minor geographical oversight that didn’t’ bear correcting. What did it matter? I just smiled at him and then to his lady in the passenger seat.